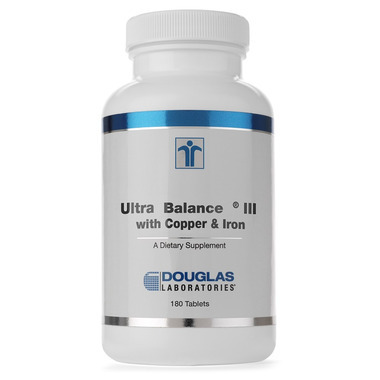 Douglas Laboratories Ultra Balance® III is also available with added copper and iron. It is a comprehensive, highly concentrated vitamin-mineral-trace element supplement containing more than 30 essential nutritional ingredients. Ultra Balance® III is more than just a multivitamin supplement. It is a potent antioxidant formula with natural vitamin E, vitamin C and selenium, a high-potency B-complex supplement, a significant source of bioavailable calcium and magnesium, and a full-spectrum trace element supplement. Each ingredient is selected in consideration of its absorbability, competitive relationship with other nutrients, allergenic potential, and long-term safety. Ultra Balance® III contains high-potency amounts of vitamins A, C, D and E, along with B-complex vitamins because of the vital roles they play in eyesight, skin, immune function, antioxidant protection, bone health, blood cell formation, and more. Minerals and trace elements are provided in their safest and most bioavailable forms, where they further help maintain good health by promoting proper muscle and thyroid gland function, energy production and healthy glucose metabolism. Ultra Balance® III is ideal for adults of all ages who want to optimize their intake of vitamins, minerals and trace elements. For many individuals, Ultra Balance® III is the only daily vitamin-mineral supplement and antioxidant formula required.